Synopsis: The life of the lawyer who became the famed leader of the Indian revolts against the British rule through his philosophy of nonviolent protest. Did You Know? Ben Kingsley mastered the ability to spin cloth the same way that Gandhi had. However, he found it challenging to spin cloth and speak at the same time. Quotables: GANDHI: If you are a minority of one, the truth is the truth. I find it appalling that anyone other than Ben Kingsley was considered for the role of Gandhi. Not simply because he was so perfect for the role, but because all of the other actors considered were white. It would have been an insult to the Indian independence movement if they had cast a white actor in the role. 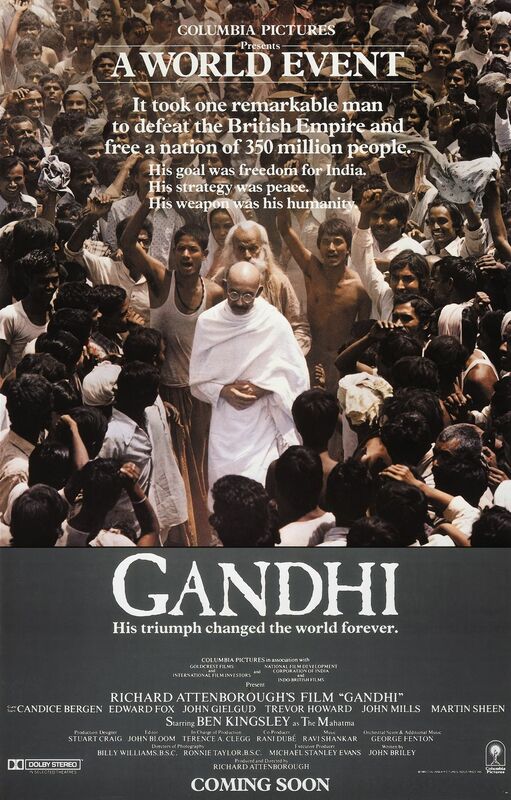 While we’re on the subject of race, it should be noted that the film doesn’t simply gloss over Gandhi’s own racism, it completely ignores it, placing him on a pedestal of Enlightenment. While living in South Africa, Gandhi said very disparaging things about native Africans. He considered them to be beneath Indians and referred to them as “Kaffirs”, a pejorative on par with that contemptible N-word. He may have been an inspiration to people of India, leading the way to bring about the end of British India, but it cannot be ignored that he had extreme racist beliefs.